On Wednesday last we gathered our shortlist, our judges, and our favourite flash fiction writer David Gaffney, and tucked ourselves into the tightest little nook Chorlton had to offer. And despite uncomfortable levels of intimacy (or because of it perhaps), we had a simply gorgeous night of little length literature. Have a look at our Facebook page for pictures. Congratulations to Michael, Simon, Cathy and Guy – stunning stories all round. Many thanks to everyone who came to the event and did a reading; all the shortlistees demonstrated just how strong our entries were this year. Coming up next, we have a super special event planned for Didsbury Arts Festival. Watch this space…. Do pop down to the fantastic grand final of the 2013 Flashtag Writing Competition. 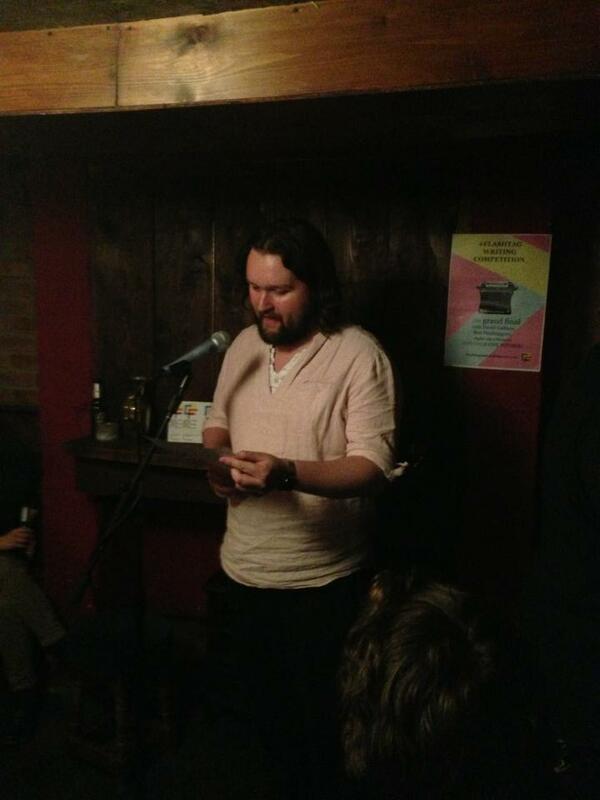 The theme of our third Chorlton Arts Festival short fiction competition was Past, Present, Future. We now have a shortlist and there can only be one winner. We’ll reveal the winner in the final. Expect booze and readings and lots of laughs. Our headliner will be Flashtag groupie and godfather of short short fiction, David Gaffney. His fourth collection of short stories, More Sawn-Off Tales, is an essential book for all short short fiction writers. 22 MAY 2013 7PM at the NOOK AND CRANNY, WILBRAHAM ROAD, CHORLTON. FREE ENTRY. Congratulations Allie, Michael, Dale, Clare, Guy, Cathy, Sarah & Simon! BUT – who has won? You don’t find out, not yet. We will announce the magnificent winner at our glittering Chorlton Arts Festival event on Wednesday May 22nd at The Nook and Cranny in Chorlton. Come along to hear readings of all 8 shortlisted stories, as well as fresh floundering fictions from the Flashtag fivesome. And if you didn’t make our shortlist this year, don’t be disheartened. We had a stupendously high calibre of stories and a horrible time whittling down to this final octagon of fiction. We say this every year, but if any one of us was a solitary judge for this competition the shortlist would be very different indeed. So congratulations once again to our shortlisted authors, see you all in Chorlton on the 22nd.